Branched Chain Amino Acid Assay Kit / BCAA Assay Kit ab83374 provides a simple convenient means of measuring the BCAA's in biological samples. The BCAA assay protocol uses an enzyme reaction in which BCAA is oxidatively deaminated, producing NADH which reduces a probe, generating a colored product (λmax = 450 nm). The Branched Chain Amino Acid Assay Kit measures BCAA's in the range of 0 to 10 nmol per sample with a detection limit of ~0.2 nmol (~10 µM BCAA in sample). 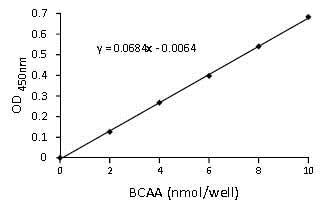 BCAA's are present in serum ~ 0.1-0.4 mM each (~0.125-1.5 mM combined). The branched-chain amino acids or BCAA's, refer to the amino acids with non-linear aliphatic side-chains, namely leucine, isoleucine and valine. These three essential amino acids make up approximately 1/3 of skeletal muscle in the human body. The branched-chain amino acids or BCAA’s, refer to the amino acids with non-linear aliphatic side-chains, namely leucine, isoleucine and valine. These three essential amino acids make up approximately 1/3 of skeletal muscle in the human body. BCAA’s are currently used clinically to aid in the recovery of burn victims, as well as for strength supplementation for athletes. BCAA’s, primarily Leu, can stimulate insulin secretion. The BCAA’s have also been implicated in a wide range of other physiological effects. 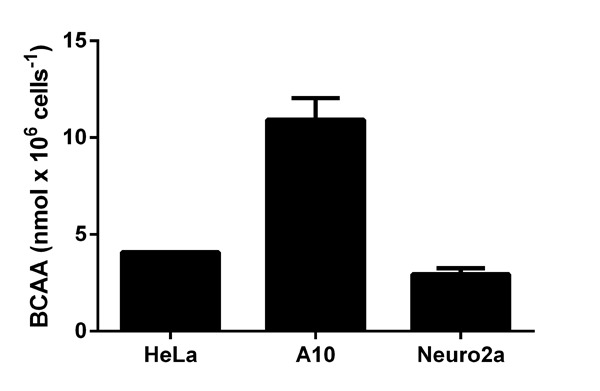 BRCAA levels measured in mouse tissue lysates (mg of extracted protein; background signal subtracted, mean of duplicates; +/- SD). BRCAA levels measured in cell lysates (background signal subtracted, mean of duplicates; +/- SD). BRCAA levels measured in human biological fluids (background signal subtracted, mean of duplicates; +/- SD). Leucine Standard Curve performed according to the attached protocol. Publishing research using ab83374? Please let us know so that we can cite the reference in this datasheet. Do you have any informations for testing muscle homogenate samples with your kits ab65347 and ab83374 ? Le laboratoire m'a confirmé que nous n'avons malheureusement pas de données expérimentales pour ces kits sur des lysats musculaires. Désolé de ne pas pouvoir vous aider davantage. N'hésitez pas néanmoins à nous contacter de nouveau si vous avez d'autres questions. Does using this kit can be determined the sum of branched chain amino acids (Leu + Ile + Val) ? Whether only leucine (standard contains the same leucine)? I am happy to confirm that this kit will measure all the Branched chain amino acids (BCAAs). All BCAAs will be deaminated to produce NADH, which is what this kit will actually measure. The Leucine in the standard will also be converted to NADH. Therefore it does not matter which Branched chain amino acid is used as standard, it will still be measured in form of NADH. Hope this information has been useful for you. Please let me know if you have any other questions.